WAM is WA’S peak industry body responsible for supporting and nurturing all forms of contemporary music in WA. Each year they run the WAMAwards which recognises achievement across multiple categories. 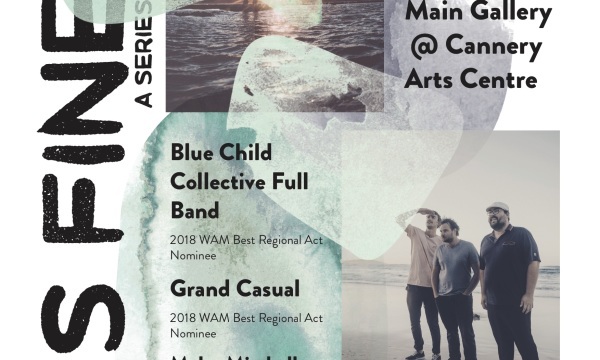 2018 saw Esperance locals Grand Casual nominated as best regional act. Grand Casual stood alongside four brilliant artists comprising of Tracey Barnett, Blue Child Collective, Kris Nelson and Tanya Ransom all of which Kyza Presents had worked with or encountered over the past five years. Kyza Presents stoked to announce the WA’S Finest Series set to kick off on Saturday February 9th 2019. The series is brought to you through collaboration between Kyza Presents and The Cannery Arts Centre Esperance with three fantastic local sponsors providing key funds to help the project become a reality, thank you to Dudley Newton Optometrists, Elders Insurance and Roger Ellett at Elpha. All workshops are free to attend and will be held at The Cannery Arts Centre Esperance. Full details and the release of ticket sales for events on March 16thand April 13th o follow.